Saat Kulesi - A livestream of the famous clock tower of Izmir on the Konak Square. Izmir: City Panorama, 0 mi. Çeşme: View over Çeşme, 45.2 mi. Míthymna (Lesbos): Town and Marina, 83.2 mi. Kos Town: Harbor and Castle of Knights, 105.3 mi. Mykonos: Waterfront and Old Port, 118.8 mi. Mykonos: View of the Old Port, 119 mi. Mykonos: Livestream Windmills, 119 mi. 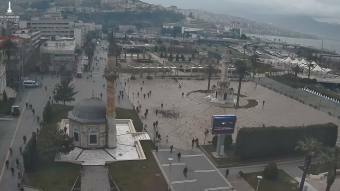 This webcam Izmir with the theme City Views was added on March 24, 2009 and is operated by İzmir Büyükşehir Belediyesi. It got 21563 visitors since then. Shouldn't this webcam work or should the link be wrong please report that here. You can add this webcam here to myCams.